In his book Islamic Jihad by MA Khan. He writes that in the city of Bethlehem Christians were 60% of the population in 1990. By 2000 they became 40% and today they are near about 15%. However Nazareth which is in Israel continues to be christian dominated. Why because in Israel Jews are the majority not muslims.Where as in West bank and Gaza which comes under Muslim control the christians might disappear within next 15 years as per the trends. Lala Lajpat Rai first tried to say that Muslim Rule was not foreign rule as the invaders settled here.Not were all like Gazanavi. Muslim rule went to turkey,syria,iran,afghanistan indonesia etc see what happened culture,language ,religion were destroyed.They couldn't destroy Turkish language but Persian was crushed for 200 yrs only reinvented after arabic words inserted into it. Some important facts about Ram Janbhoomi and Babri Masjid issue. 1. 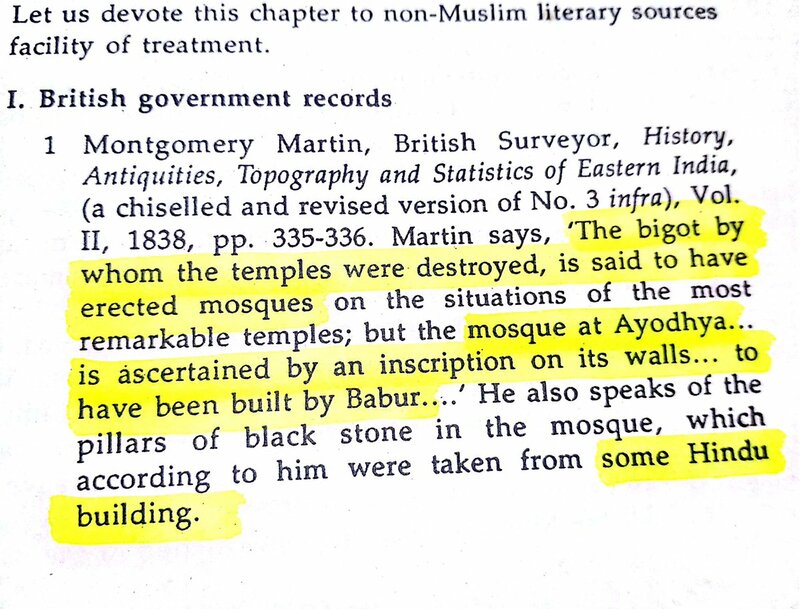 Montgomery Martin a British Surveyor in 1838 says that the mosque in Ayodhya is built on some Hindu Building.